Pine Glen offers an intimate enclave of 36 single-family homes in highly sought-after Doylestown. 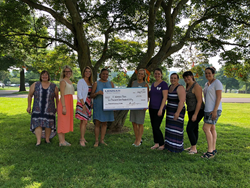 Lennar presented a check to A Woman’s Place on May 30th for $10,750 after a successful “Open Hands, Open Heart” event at Pine Glen earlier this month. “We really wanted to come together to help the women in our community who are struggling and A Woman’s Place is a wonderful organization that is committed to the empowerment of women and to ending domestic violence for all,” said Anthony Mignone, President of Lennar’s Tri-State Division. Lennar Corporation (NYSE: LEN and LEN.B), the Nation’s leading homebuilder, recently hosted an “Open Hands, Open Heart” Mother’s Day Weekend at Pine Glen, a single-family new home community in Doylestown, PA. The event raised $5,000 in donations and Lennar matched those donations to present a $10,750 check to A Woman’s Place on May 30th. As the only domestic violence organization in Bucks County, PA, A Woman’s Place provides comprehensive free, private and confidential service, support, education, outreach and advocacy to victims of domestic violence and their children and the community. During the event, attendees were able to tour the Pine Glen community. Part of the highly acclaimed Central Bucks School District, Pine Glen offers an intimate enclave of 36 single-family homes in highly sought-after Doylestown. Priced from the upper $400s, Pine Glen offers five spectacular home designs to choose from with 2,315 to 3,447 sq. ft. of living space. Each open concept plan features four bedrooms, two-and-a-half baths and a two-car garage. A first-floor owner’s suite plan is also available. The community is just three miles from Route 611, 202 Bypass, PA Turnpike, Blue Route, Doylestown Borough and the Chalfont and Doylestown Train Stations. Nearby Peace Valley Park and Lake Galena boast 365 acres of lake fun. Enjoy your days fishing, kayaking, running, biking, paddle-boating, sail boating, picnicking or just soaking up the picturesque scenery. To learn more, stop by the Pine Glen Welcome Home Center, located at 133 Ferry Road in Doylestown, PA or visit http://www.LennarPA.com.